These dynamic 3 hours will consist of: making ghee, the oral and hands on history of this tradition + learning about medicinal herbs and spices. We will be learning about the importance of fat for our bodies and how we can view fat as a medicine through the intake of ghee, an ancient medicine that originates in India. 2,000-5,000 B.C In addition, participants will learn how to extract herbs into ghee, thereby amplifying their medicinal properties. Everyone will take home 2oz of organic, grass fed homemade medicinal ghee, a recipe of how to curate and cook with this fat. Sandeep and Nalini are the co-founders of Princeton, N.J.- based Pure Indian Foods, which makes grass-fed, organic ghee and sells traditional organic Indian foods. Their interest in dairy history grew out of Sandeep’s family’s fifth generation ghee business (started by his great-great-grandfather in 1889) and the culturally significant role that dairy plays within his Indian heritage. The Agarwal’s have brought the Ayurvedic Medicinal Ghee concept to a culinary level by introducing unique herb/spiced ghee products sold as food, which has been recognized by The New York Times. This is a 5 part mushroom intensive, each class focuses and uses the information given from the previous. We will meet once a month starting in May-September (except August). Those who are registering we ask that you commit to all 5 classes. Let us use all our senses to learn about the vast & diverse world of mushroom & fungi. Examining their ancient story that connects humans and all life to them. Take a look at the roles mushrooms play within our lives, the forest, and in food systems. Learn basic concepts of mycology, the study of Fungi. Enter into the "wood wide web" and find out how these organisms exist in nature & in return be nurtured by them, for food, medicine & ceremony. Together we will explore the many ways we can integrate Fungi into our systems. One of the easiest ways is by eating them and using simple teas to gain their nutritional value. In this class, we will demonstrate and taste easy ways to cook all kinds of mushrooms, Oyster, Shiitake, and Lions Mane. Samples of various teas will be available to taste too. In this skill share we will enter an in-depth exploration of all things grain and fermentation. We will explore the different grains and their properties, how to incorporate it into your daily life even when you’re pressed for time, and how it can dramatically improve your health, as proven by both traditional and scientific research. We will begin this journey by honoring our ingredients, through learning about different kinds of grains found around the world and locally, their properties and histories, as well as the growing, harvesting and processing practices. When plants are taken out of their traditional contexts and into a mass produced and commercialized product, for example wheat we see the destructive repercussions that it can have on land and the body. This skill share aims to learn about this ancient grain from its traditional usage in order to better understand how to be in relationship with it. Finally, we will learn about how fermentation of grains and legumes have sustained us for millennia, and how they can continue to do so in our modern lives. These are concepts and methods you will be able to take into your kitchen, your diet, and your culture. Ava Zarich is a practitioner of health, in academics, by profession, and in daily life. She is influenced by generations of folk medicine and sustainable agriculture in her Croatian family, and the progressive yet culturally inclusive approaches towards health in her hometown of San Francisco and her longtime home of New York. She is both student and teacher of community health, traditional nutrition, agriculture, and all things that bring power and self-sufficiency into the hands of communities that need it most. She believes that bringing health to individuals and their communities is a potent form of resistance and one small step of many needed to heal our planet. Most importantly, she believes all individuals deserve the right to enjoy their lives, the delicious food we’ve been blessed with, and the healing benefits of food cooked with culture, curiosity, and love. Explore the deep history humans have with medicinal mushrooms & their power to heal. Identifying uses, and ways to prepare them. We will demonstrate the vast options and diversity of properties within just a handful of selected varieties. This evening we will serve a flight of various teas to really get a feel of their energetics and flavor complexes. Becoming familiar with our healing allies, Turkey Tail, Reishi, Chaga and others. We talk step by step, the methods of extraction for use and preference of compounds desired, and resources available. Together we will discuss sustainability and sourcing surrounding this growing field of natural healthcare. Everyone will be making their first part to an 8 oz. double-extracted Reishi tincture, to then take home to complete at a later date. In class discussion and lecture about wild mushrooms, their anatomy, ecology, patterns to look out for when in the field. We share our ethics of foraging, do’s and dont’s, and how to properly harvest based on your needs. We will display the various wild mushrooms and Fungi that will be ‘in season’ to notice and point out when we do go to the woods the following day. Together you will gain the confidence to safely start identifying wild mushrooms. The intention for this intro to urban herbalism course is to grow each individual’s awareness and relationship to their own internal ecology, urban ecology and the messages the plants growing in this bioregion are sharing with us. All participants will take home medicine made each day after class. Aside from topics covered in class, students will engage in reading and hands on assignments that will support their ability to integrate the material into their personal healing practices. If you are not accepted this round there is another course in September. Learn some basic methods for growing mushrooms in your garden or indoors. We will explain direct methods of cultivation & substrate formulation. Setting up labs, fruiting rooms and other small, DIY, grow spaces, indoors for year round production. Discussing the benefits and setbacks of indoor & outdoor production. We will visualize was it looks like to creating myco-communities by growing and sharing the uses of fungi and mushrooms to better create networks and consistent growth of health, sustenance & sovereignty. Everyone goes home with their own mushroom spawn starter to begin growing oyster & wine cap mushrooms. In this two hour skillshare participants will learn about several medicinal plants growing in New York State and how we can build mutually regenerative relationships for our survival and wellbeing. Our body, mind and spirit can often be weighed down by all of the stimulation we are exposed to in this day and age. This workshop is intended for folks interested in continuing their journey with herbs and curious to learn how to make their own medicine. Participants will leave with their own herbal tea blend and knowledge of how to make water based plant extracts such as infusions and decoctions, as well as other menstrums that can be used for medicine making. 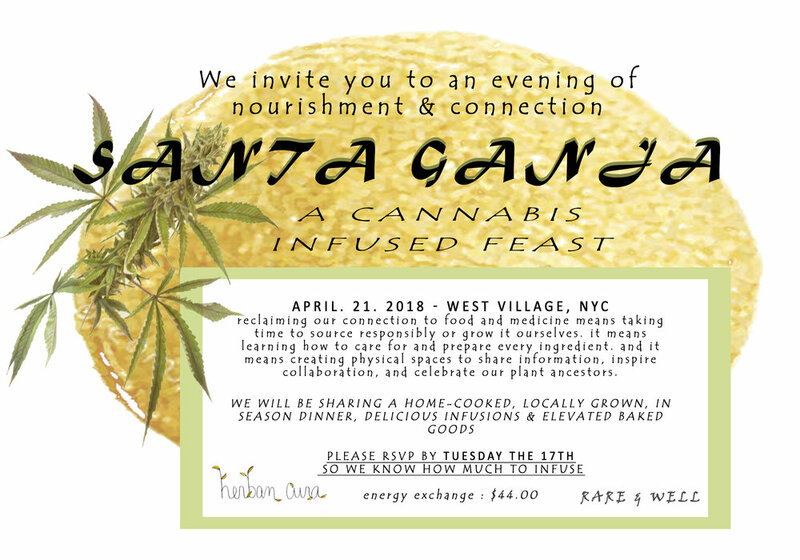 Antonia is an herbalist born and raised in NYC. They have apprenticed with several herbalists around the Northeast and South America and are currently in their last year of herb school. They graduated from Bard College where they studied environmental and urban studies. They are a community organizer, gardener, food and environmental justice educator. They are also the co founder of collectives: Brujas and Herban Cura. They are passionate to share their knowledge with other folks especially in urban centers, in order to interrupt notions of individualism and separatism from nature and grow towards collaborative and symbiotic communities. Making CBD Medicine workshop led by herbalist, Sarah Wang will cover the basics of using master plant, cannabis sativa, to make oral and topical medicine. In this workshop we will answer some of the following questions and learn the practical application of making this medicine along with proper dosing (amount & frequency) for yourself or loved ones. We will go through all the steps of medicine making with a hands on component and medicine to take-away. Feel free to bring a notebook for note taking. -What ailments can be treated with this medicine? -How do our bodies receive and interact with this medicine? -How can we source and make this medicine ourselves? Sarah Wang is a artist (@sarahwangart), curator (@disclaimergallery) and practicing herbalist who has been working with cannabis as medicine for the last 8 years. She makes healing oral and topical medicine for her CBD/THC line called MU Healing (@muhealing) and a small batch pepper sauce for her all-natural sauce company, Wang Sauce (@wangsaucenyc). She is a photographer who works in documentary photography, collaborating with subjects to tell their stories. She’s an Aries sun + moon + mercury, Aquarius rising with lots of Capricorn mixed in there. Within a fragile healthcare system, plants offer an important role as preventative and accessible medicine. Plants can be powerful allies to support our grounding, mental clarity, adrenal and musculoskeletal system. However, as herbalism grows in popularity and becomes commodified, we risk the distortion of this timeless tradition. Providing accessible medicine can be likened to building accessible food systems. Learn about several local plants growing in the Northeast and how we can build mutually regenerative relationships for our survival. Throughout this discussion, participants will have chance to taste herbal teas and deepen their awareness of their own body systems. Please join us for a neighborhood walk along the Brooklyn Heights Promenade with Antonia Pérez, where we will investigate the medicinal properties of plants, followed by a tea workshop at Picture Room. In this three hour Urban Herbalism workshop we will walk along the Brooklyn Heights Promenade with Antonia Pérez, identifying the medicinal plants along the way. We will observe the plants in depth through free form drawing of the patterns we find in them. Back at Picture Room, we will deepen our understanding of how to extract medicinal properties of plants via water, as we sip on herbal tea. Participants will leave with their own alchemized tea blends. Join Jade of 69Herbs and learn the basics of making your own medicinally infused bath bombs. In this gathering we will be making herbal bath bombs from scratch! So often bath bombs from companies are expensive and filled with chemicals, leaving residues on our bodies and our baths. Using only dried herbs and flowers, baking ingredients, epsom salts, and essential oils, we will learn how to craft our own natural bath bombs for different moods, herbal benefits, and scents. Each participant will take home a recipe that you can replicate at home as well as 2 bath bombs that you make. Jade is a farmer, artist, & herbalist at 69herbs. they have been farming & gardening for the last 8 years. In 2018 they studied herbalism at Wild Gather: the hudson valley school for herbal studies. Herban Cura will guide a conversation on the current use of sacred plants such as white sage and palo santo, exploring the ecological and societal impacts of using these non local plants. White sage and Palo Santo are powerful cleansers that have been used for thousands of years. Both of these plants do not grow wild in the northeast, yet in the past 10 years have become increasingly popular, having an impact on the survival of the plant itself and the communities that have cared for them. In this workshop participants will learn about local plants and mushrooms growing in NYC that can be used for smudging, burn blends, and resins. All will learn to make bundles with the power of intention and social awareness. Herban Cura believes that using the plants that grow where one lives is necessary for sustaining ecological resources, respecting ancestral practices, and for the the powerful messages these plants have to offer. In this two-hour hands on workshop you will learn the basics of herbalism. If you're interested in plant medicine but don't know where to start join us for this Herbal Potion-Making course. Living in NYC we can often become disconnected from ourselves to a point where we get sick from overworking, not resting enough, overstimulation etc. Plants can play a crucial role in supporting us to rethink and reframe our relationship to ourselves and our time. We want participants to leave feeling a deeper sense of connection to themselves and the plants that grow in our bioregion. Simultaneously, as we learn to care for ourselves we must learn to care for the plants whose medicine we are using. Traveling with the wind, are yeasts, mushroom spores, pollen, bacteria, and toxins. Often invisible, Eating Air highlights the role of what is carried in the air in shaping how and what we eat. Fermentation, pollination, and pollution are a few of the themes that guests will encounter through a multi-course meal and drinks. Philippine Herbalist Angela Angel is visiting the Northeast from out West and will be joining with Herban Cura to share with us the teachings of seeds. Seeds hold so much information, medicine and delicious nutrition. In this workshop we will have the opportunity to learn about the medicinal properties of some seeds, the oils that can be extracted, and the foods that can be prepared from them. The cost of this workshop is $75 which includes material costs and foods we will be eating. All participants will be bringing medicines home with them. Limited spaces available. 15 spots. Through breath, sound and movement we will connect with the elements Earth, Water, Fire and Air in our bodies to invoke intuitive organization, harmonization, alignment, and purification. We become channels of prayer for the elements of the world, harnessing the potential to support the regeneration of Planet Earth through our own physiological wisdom. This will be a time of warming up the body, activating our subtle channels, stretching out tensions, heating up muscles, stimulating circulation, relaxing deeply, deepening flexibility and relaxing generously and breathing fluidly. Please come in comfortable clothing, something you can move around freely in. West Village - Address and further details will be sent upon registration. or pay in cash the day of. Xocolatl is Nahuatl for Chocolate or Cacao and Samai is Quechua for Breath, Spirit or Soul. We will start off the morning workshop with Daniela, who wil lead us through connecting with the Ancestral Tradition of Cacao. Ever wondered how cacao becomes chocolate? We will roast, peel and prepare a delicious, nourish, oxygenating Xocolatl recipe. We then invite you to join us for evening of Samai, oxygenating our bodies with fresh cacao, prepared in the morning, then move into breathing through the elements in our bodies to connect, purify, nourish, regenerate and vibrate in gratitude. Our bodies are made of the same elements as the planet we live on, as we honor and re-inspire the elements within us we become channels of healing for our world. Address & further details will be sent upon registration.